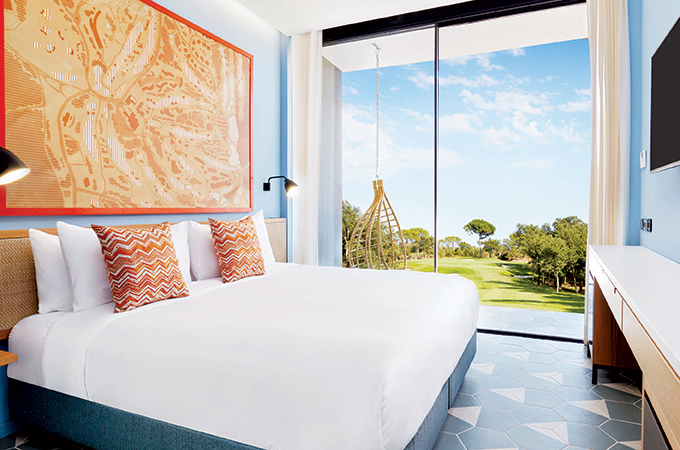 Caddy Rooms is an exciting new lifestyle hotel situated within the PGA Catalunya Resort, home to two exceptional golf courses: The Stadium Course, ranked No.1 course in Spain, and the Tour Course, which suit players of all levels. Set in an area of outstanding natural beauty, the PGA Catalunya Resort is also a gateway to explore the diversity of Catalunya, with the backdrop of the Pyrenees and the rugged coastline of Costa Brava. The resort and surrounding area provide the perfect terrain for road biking, mountain biking, while guests can venture further afield on horseback, taking in the breath-taking vistas as they go. Ideally located just 10 minutes from the historic town of Girona and an hour from the vibrant metropolis of Barcelona, Caddy Rooms is an ultra-modern 50-room boutique hotel. Characterised by its precise and intelligent design, Caddy Rooms retains a stylish and contemporary aesthetic throughout. Technology is at the centre of the Caddy Rooms experience, ensuring a seamless journey for guests from the point of arrival. Breaking the mould of a traditional check-in, guests are able to do so prior to arrival via the dedicated hotel app or at the iPads situated in the Bar, gaining access to a digital room key and allowing guests to communicate with the hotel and its services at the touch of a button. In addition, guests do not need to check-out at the end of their stay. Large communal spaces at Caddy Rooms create inviting, vibrant social areas in which guests can unwind after a day’s adventures. Facilities include bicycle rentals, running circuits, outdoor tennis and padel courts, a fishing point and Forest Park, the resort’s own zip line adventure park. Guests can take the opportunity to create a picnic for the day ahead from the Pure Food Market, and in addition, can indulge in fine dining at neighbouring 5* Hotel Camiral at its signature 1477 Restaurant, or experience a more relaxed affair in The Club Café. Room rates at Caddy Rooms start at €140 ($160) per night in high season, and €120 ($137) per night in low season. TTN is the most established trade publication in the Middle East distributed on a controlled circulation basis to members of the travel and tourism industry. Published monthly by Al Hilal Publishing and Marketing Group, the region’s foremost trade publisher, TTN is aimed at professionals in the industry, from travel agents to airline and hotel personnel. TTN provides in-depth and extensive coverage of relevant issues in the Middle East and North Africa as well as in other parts of the world. Travel related news, analysis, and new appointments together with information on up-coming exhibitions, marketing and promotional campaigns are presented in an innovative and striking colour tabloid. Every issue also contains a collation of international and regional news and topical features of interest to readers. ©Copyright Al Hilal Group 2017. Designed and Developed by Northstar Technologies.